Lu worked as an advertising copywriter until she escaped to become a librarian and study for an MA in Writing For Young People at Bath Spa University. She shares her house with a surfeit of young adults who won’t leave home and keep calling her “Mum”: she finds their dialogue, strangely disturbing habits and erratic sleeping patterns a constant source of inspiration. She lives in Bristol, but her heart is in Cornwall. Lu writes myth-based YA fiction in a kitchen sink paranormal style. Her agent is Ben Illus at The BIA and she is published by Usborne. 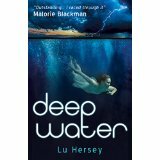 Lu won the 2012 Mslexia Children’s Novel Writing Award with Deep Water. Malorie Blackman has described it as “outstanding”. Find Lu on Twitter @LuWrites and at https://luwrites.wordpress.com/. When her mum vanishes, Danni moves to a tiny Cornish fishing village with Dad – where the locals treat her like a monster. As her village’s dark, disturbing past bubbles to the surface, Danni discovers that she’s not who – or what – she thought she was. And the only way to save her family from a bitter curse is to embrace her incredible new gift.